Sous-vide means ‘in a vacuum’ or more literally ‘under emptiness’ (very French and philosophical that eh?). 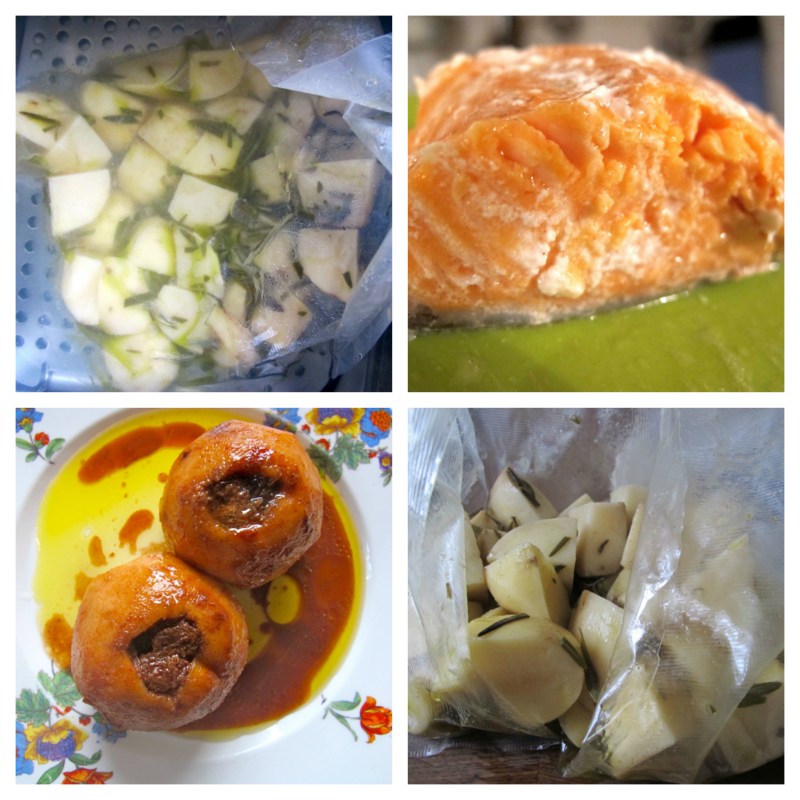 Food is sealed in an airless plastic bag and cooked slowly, at a low temperature, for hours. 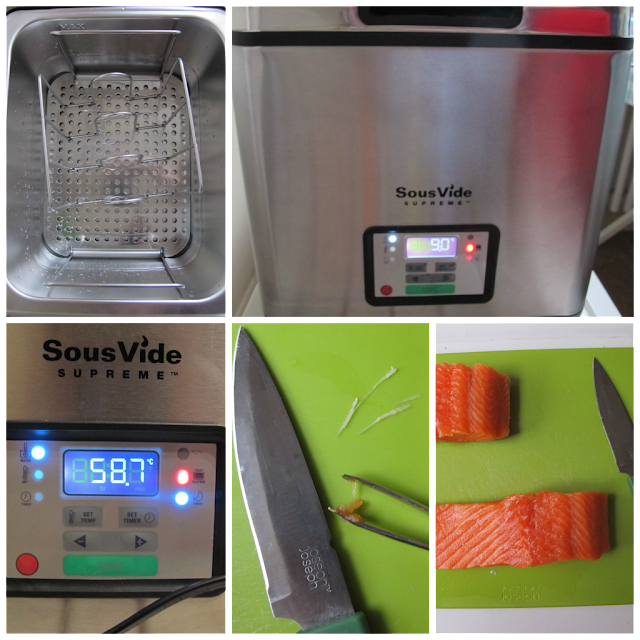 I was sent a sous-vide supreme machine, cost £450, to see what I thought of it. It’s the size of a small microwave oven, so could easily be incorporated into a domestic kitchen. I found all the machinery, including the seal pack machine, very easy to use. 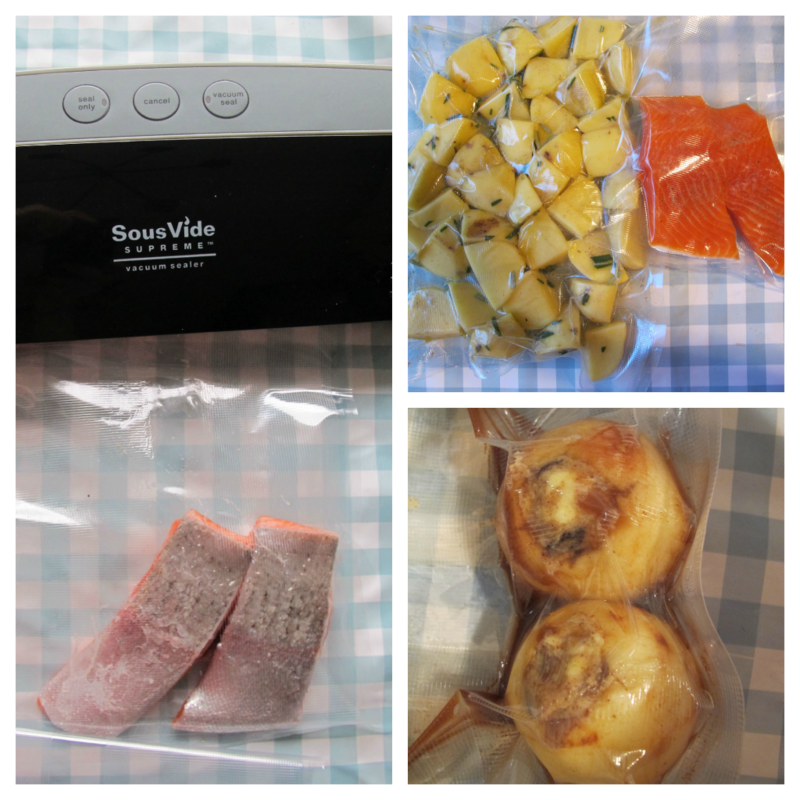 The machine came with an accompanying booklet suggesting that fish, potatoes and apples could also be made the sous-vide method. I tested two pieces of salmon, some potatoes with rosemary, and made spiced apples. The salmon I poached for 50 minutes at 60ºC as per the instructions. Chefs on Twitter and Instagram immediately suggested that it should be cooked at a lower temperature, say 47ºC. The fish that emerged at the end of 50 minutes, was somewhat boil in the bag in texture and necessitated finishing off with a quick searing on both sides (especially on the skin side, I can’t stand soggy fish skin). Once seared, the fish did taste good. The fact that it had already been cooked in the centre meant that one didn’t have to wait until it was cooked through. I could see this being very useful for a restaurant having to do several identical covers very quickly. The rosemary potatoes however were a disaster. I cooked them at 93ºC for hours. In the booklet it suggested 1.5 to 2 hours at that temperature. I ended up cooking them all night but they still had an uncooked texture at the end. Chefs on Twitter talked of only using waxy potatoes rather than floury. Perhaps that was my mistake. Finally the baked apples, stuffed with raisins, butter and spices, were cooked at 93ºC for several hours. These lacked the simple deliciousness of normal oven baking: split skins oozing, a soft yielding interior texture, the slight caramelisation around the edges of the core. While they were cooked through, the consistency was also rather granular. I wouldn’t particularly recommend this method for this recipe. According to the videos, sous-vide does preserve the colours of vegetables such as courgettes and carrots, without overcooking them. I might try that out. For me the best method of cooking is something that approximates fire. As someone who doesn’t cook meat, probably I’m not seeing the technique at it’s best: for this slow poaching method stops meat becoming tough during the cooking. I’m also inherently suspicious of food cooked slowly at a low temperature on a food safety level. As with canning, one risks botulism if the food isn’t eaten straight away or chilled. Honestly though, it’s not a patch on my Aga, but has its uses no doubt. Yeah I can see where you're coming from. As I said when we were having a natter the other day, I think sous vide is a method of cooking that is most suited to meat – the kind of joint that needs to be slow cooked to break down. Pork belly for example. This is obviously no use to you whatsoever. I would be interested to try fish but as you say, it will need searing afterwards. I did a quince which was nice but I slightly over cooked it so I'll definitely give that another go. Such an amazing fruit. I love quince. I just did a quince, walnut, and dried lime stew that I sort of ripped off of Sally Butcher. Re sous vide, they haven't taken the machine away yet so I'll have a go at sous videing (? grammar) carrots with their tops. How was the texture of the quince? Such a great info! its help me a lot..thanks for sharing! keep it up .